Your tour begins with a quick stop near McCarran International Airport where you can see the planes for Janet Airlines. This fleet of unmarked jets transports workers to and from Area 51. Next enjoy pleasant views of the desert in an SUV ride as you head towards Area 51. You will continue on your journey and see an ancient Indian petroglyphs that resemble aliens. Wander around a strange, unexplained dry lake bed, the site of many UFO sightings. 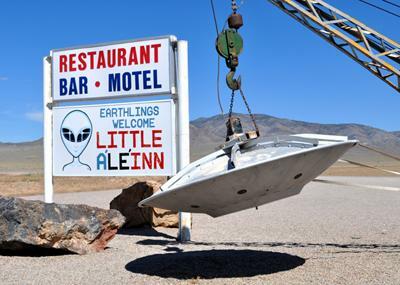 You will get back on the road and travel along the “Extraterrestrial Highway” and arrive at very remote, Little A’le’Inn. This location has been the host of many documentaries and movies including “Independence Day.” Here, you can find a manual with tons of top-secret Area 51 information in the Little A’le’Inn store. Capt. Chuck Clark, an ex-air force captain, wrote this chilling, yet informative booklet available for sale. After a tasty Alien Burger at the inn, things get mysterious as you travel to the location of the renowned black mailbox that represents the entrance to Area 51. After traveling through the Joshua Tree Forest, you will arrive in the perimeter of Area 51. See guards nicknamed the “Men in Black” watching your every move and see signs that read, “The Use of Deadly Force Authorized.” As much as the United States denied the existence of Area 51, this tour proves that it does exist.